College time is a golden phase in everyone's life. You will make many unforgettable moments in your life as well as get lifelong friendship, meet new people from all around the world, important life lessons, etc. Undoubtedly, you are going to have amazing memories to cherish forever. However, college days are not only about thrill and fun, but also attending the lectures and practical sessions. Along with that, you have to write a plethora of assignment. Since you're fresh out of high school, it is not so easy for you to manage so many things at a time. Sometimes, it can be overwhelming. Although attending lecture is the thing that you have to manage by own, we can help you out with your assignments. Our experts of Australian assignment help service have come up with a few crucial points that you need to keep in mind while writing college assignments. You will never have to worry if you follow them properly. The first thing that you need to make in order to write your assignment is the list of objectives and set reminders for that. For example, divide the research part or the composition of your work into different sections. A reminder will act like a mean through which you have to achieve all the goals with every passing day. An assignment can’t turn out into an impressive one until and unless it is written with proper planing. And planning cannot be done without setting goals. 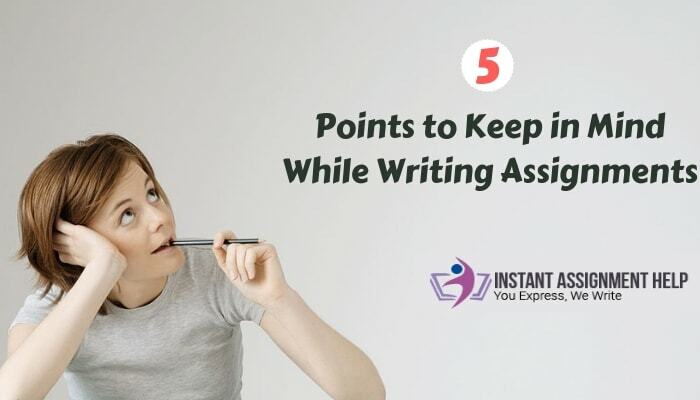 It is one of the crucial steps that you need to follow while writing your assignments. As professors generally ask students to write assignments on complicated topics, you should carry out extensive research to gather relevant content. For that, visit library, ask Google, or if needed, take help from your professor. Apart from these, you should attend seminars and conferences. All this will enable you to have the best piece of information that can be beneficial for your assignment. As you have just got enrolled in college, there might be a chance that you don't have an idea about plagiarism. So, basically, it's serious academic misconduct that you must avoid. And, the best way to do so is by making a list of references that you have used in order to collect useful data for your assignment. No academic paper is deemed authentic without mentioning the proper credits. Practice makes a man perfect; this is applicable here too. Writing is one of those skills that one can develop after regular practice. We all know how important this tip is. Setting goals and doing thorough research will never work if you don’t have proper skills to pen down the collected information in an effective manner. So, if you want to attain the desired result in your assignment, then you have to develop good writing abilities. A reminder should not only be set to achieve the goals but also to avoid procrastination. It is common during the initial days of college, so the best way to utilize most of your time is by diving the heavy workloads into the smaller ones. Investing one or two hours a day will keep you ahead of your classmates. We all know that to accomplish any task, the toughest thing is to take the initiative for it, and that's why scholars always procrastinate the work. Although, you don't have to be like them. To overcome the stress of studies and assignments, go through the above-mentioned tips. Following them properly will undoubtedly ease your academic burden. Always remember that the first year of college is just the beginning, there is a lot more to come into your life. So be ready for that.